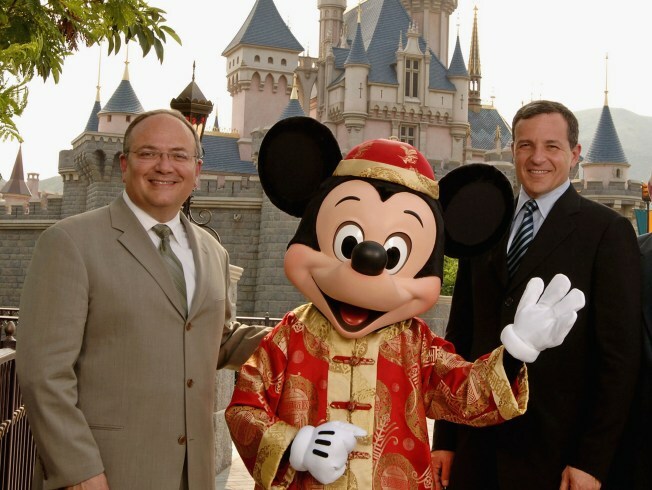 In this previously unreleased handout photo Disney executives (L-R) Jay Rasulo, president of Walt Disney Parks and Resorts, joins Mickey Mouse along with Bob Iger, president, chief operating officer and chief executive officer of The Walt Disney Company. Call it a Mickey Mouse scheme. Or a cautionary tale about too much information floating around Disney's corporate communications office. A secretary from that office in Los Angeles and her money hungry boyfriend allegedly had access to Disney's internal earnings reports and tried to peddle them to hedge funds, Manhattan federal officials charged Wednesday. The couple also apparently believed that Disney was intent on selling off its network subsidiary, ABC, according to this March 15th e-mail, part of the criminal complaint. "Bob Iger (Disney's CEO) is in serious and advanced negotiations with two private equity firms to sell them the ABC network, but no price has been determined yet," the couple wrote, according to the complaint. Disney denied that, emailing NBCNewYork a statement that read: "The reference in the complaint to conversations regarding the ABC Network were and are false." Bonnie Jean Hoxie, 33, a secretary to Disney's head of corporate communications, and her boyfriend, Yonnie Sebbag, 29, were accused of sending an anonymous letter to more than 20 hedge funds in March, claiming access to Disney's quarterly earnings before their release in May, according to documents. Sebbag allegedly told undercover agents that he wanted "to make a lot of money" but didn't "want to go to jail," said the Securities and Exchange Commission, which also charged the couple. Instead, the hedge funds secretly tipped off the feds who ran a sting, got Sebbag's grammatically challenged, incriminating emails, secretly recorded him talking about a champagne future and charged the couple with conspiracy and mail fraud. "I dont (sic) think we will get caught if we stay discrete (sic) and careful," e-mailed Sebbag, alias Jonathan Cyrus, to the undercovers posing as interested buyers. At one point he wanted to sell the information for $15,000 then upped the price to half the profits expected from the insider trading, according to the SEC. Hoxie also had expensive tastes, e-mailing her boyfriend to buy her a $700 Stella McCartney designer bag, according to the SEC. "Hoxie and Sebbag stole Disney's confidential pre-release earnings information and put it up for sale," said Robert Khuzami, director of the SEC's division of enforcement. "Fortunately, multiple hedge funds reported the illicit scheme, and the SEC and criminal law enforcement authorities acted quickly to stop this brazen attempt to establish an ongoing insider trading business." The head of Disney's corporate communications office is Zenia Mucha, a top aide to former New York Governor George Pataki. She joined ABC in February 2001 and then moved to Disney the following year. Hoxie and Sebbag, who live in Los Angeles, were expected to appear in federal court there Wednesday. If convicted they face up to 25 years in prison. Manhattan U.S. Attorney Preet Bharara said officials are "committed to prosecuting all individuals -- on whatever rung of the corporate ladder -- whose greed motivates them to betray their employer's trust and corrupt the market."